So you aced the interview, meshed with everyone, and eagerly jumped into the new position…only to discover that you’d been bamboozled – this was not the culture you were sold! What went wrong? 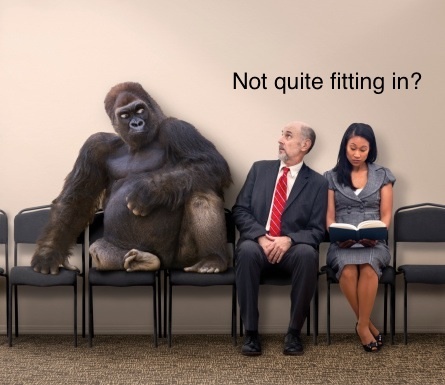 Companies are living creatures with established personalities and perspectives. You can gauge some of that character by carefully inspecting their brands, though most of it you learn only through immersion within the company’s culture, by working alongside fellow employees, and by living their core values. At some point you may begin to feel that your own values are clashing with the company’s expectations of you, and that the culture you were promised during the interview does not match the reality of this new daily grind. Worse yet, you might not be in a position to drop everything and walk away. The good news is that culture’s reach is ever-present, and you can discern the tone of a company’s culture, even if you’re granted just one interview in which to do it. 1. Employees are devoid of mirth. If there’s nary a smile nor chuckle floating around, then lightness may have been squashed. When you’re dealing with serious topics at work, there’s no need to be staid and somber to be good at what you do. Laughter breaks up adversity and supports community among team members. 2. The physical space recedes into lifelessness. If sterile gray cubicles leave you feeling blank, there’s no color for miles, and no objects to inspire, then this dullness speaks to a fundamental problem in ambiance design and creative expression. 3. People are fatigued, dragging along, and bleary-eyed. Employees may be sleep deprived from being (obnoxiously) overworked, and are probably operating within an inflexible system that fails to honor their wellbeing. Uninspiring, low energy atmospheres tend to signal a larger workplace pandemic. 4. The interview feels suspiciously scripted. Do panel members give eerily similar responses to your questions about the environment? Then management could be directing the script. Likewise, if you feel insulted by their stale, irksome questions (Where do you see yourself in five years?) and if the exchange feels more like an interrogation than a conversation, then this stock question approach will do nothing to assess your true personality, leaving you unseen and unheard. 5. You aren’t treated like a human being. Have they made you feel like a real person or like yet another number on the lengthy list? If panel management conveys a fossilized attitude à la I’ve-been-here-a-long-time-and-I-call-the-shots, then those interview nerves you’re feeling are more likely foreshadowing supreme antagonism. It would be wise to move along. You meet all kinds of people during the interview process which highlights the importance of individualism and how it contributes to being part of something bigger. I noticed very quickly that everyone liked each other, and through the collaborative interview process on-site I was able to see, and not just hear, how the team interacted. It was clear that they knew each other well and worked as a team. What struck me when I talked to folks at Nuvera the first time was that it was a welcoming, friendly, playful, (though clearly business-focused) environment made up of smart colleagues who obviously enjoyed working together. We’d love to get your take on it: tell us about your favorite interview deal makers – and worst deal breakers.